I can’t say for sure when I first discovered KIND Oat and Honey Clusters, otherwise known as the most delicious granola on the face of the planet. I can tell you that my life—or at least my breakfasts—haven’t been the same since. The weird, nutty quinoa-crunch of it is the perfect complement to homemade yogurt and blueberries (is it blueberry season in Upstate New York yet? No? Darn.). With unconventional granola ingredients such as quinoa, amaranth and millet, I somehow assumed this style of granola would be too tricky to make at home. A book called The Homemade Pantry: 101 Foods You Can Stop Buying and Start Making and a couple of recipes on Glutenfreeonashoestring.com changed my mind. 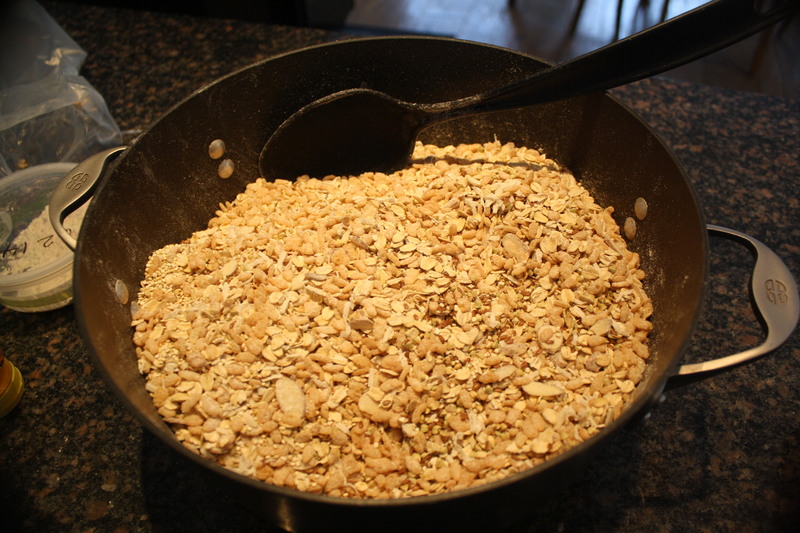 From the book, I got the best tip ever about baking granola: That you should do so at 250 degrees in the top two-thirds of your oven for multiple hours, and that you should leave the granola in the cool oven for several more hours once it’s done cooking, so it will harden and crisp more. Cookbook author Alana Chernila is a genius for this suggestion, in addition to the inclusion of sea salt, cinnamon and vanilla extract. From the recipes—one for peanut-butter granola and another for maple-quinoa clusters—I learned to stop worrying and love my buckwheat groats. So last weekend, I purchased those and several other grains (amaranth, millet, brown-rice flour, brown-rice cereal) from the bulk section of Healthy Living Market in Saratoga, our local natural-foods store, and got busy baking with a goal of imitating my own favorite KIND flavor, Oats & Honey Clusters with Toasted Coconut. First, I mixed the dry ingredients (rolled oats, quinoa, buckwheat groats, flax seeds, rice flour, almonds, cinnamon, sea salt and other stuff shown above and listed below) together in a large pot. I then combined the wet ingredients (vanilla, plus a surprisingly small amount of maple syrup, honey and canola or safflower oil) and mixed the whole mess together. Then, I poured the whole mess onto baking sheets lined with parchment paper. That’s it for your prep work! I cooked my first batch at 250 degrees for an hour and a half, mixing the granola and shuffling the trays once every 30 minutes. I think I left the second batch in there for four hours without any shuffling at all, and it was just as good, if not better. In both cases, it filled the house with an amazing nutty-cinnamony-vanilla aroma, like a fancy candle. (Yankee Candle Co.: “Maple-quinoa granola” is trademark Amy Reinink 2014, got it?). 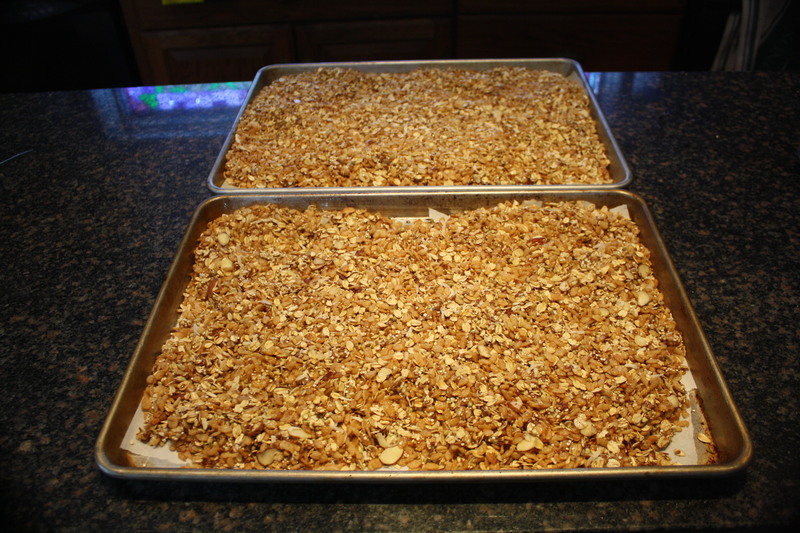 In both cases, I let the granola sit in the cool oven overnight, which I’m convinced made it extra-crispy. 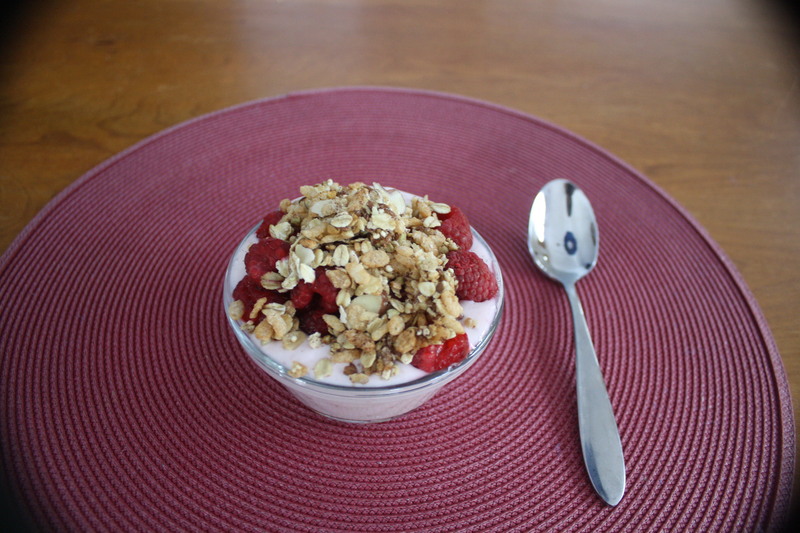 This stuff is so amazing, I’ve had to make extra yogurt to keep up with my consumption. Follow instructions above. Devour. And be sure to let me know which variations you tried! Well that just looks scrumptious!! I was not previously aware of this granola, but it has now consumed my life. Ironic, perhaps, but I still blame you. I love it when you can successfully copy a recipe for home cooking! Nice work, Amy. Back when I ate grains, after a few not so successful tries, I landed on the Cook’s Illustrated recipe. It uses maple syrup (the real stuff of course), adds the dried fruit after the baking is done, and, you don’t stir. At all. In fact you press the mixture tight into the pan. That keeps it crisp and in big chunks you can then break into your preferred size. What an awesome tip! I tried this with my latest batch, and it did end up much chunkier (in a good way)! 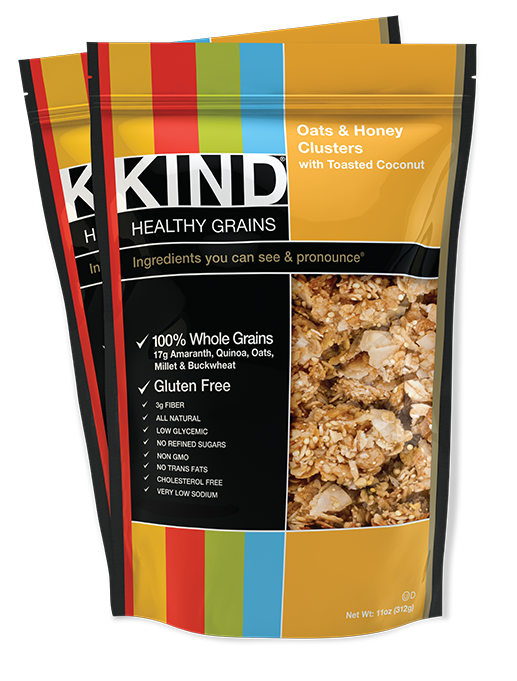 I haven’t tried the granola, but I just tried the KIND oats and honey grain bar! Addictive! The ingredients look pretty similar in both. Any thoughts on how to adapt this recipe to bar form? Great idea! I think the main trick would be getting the ingredients to bind together, which may not happen with this tiny amount of honey/maple syrup. TheYummyLife.com offers a recipe that may be useful: http://www.theyummylife.com/Homemade_KIND_Bars. Let me know if you try it! This stuff is great and so much cheaper! I’m about to try your recipe but notice there are no nuts or flax seed measurements in the above recipe? Also, are the buckwheat groats whole or coarsely ground? Have you tried using coconut oil instead of safflower oil? Thanks! Great questions. 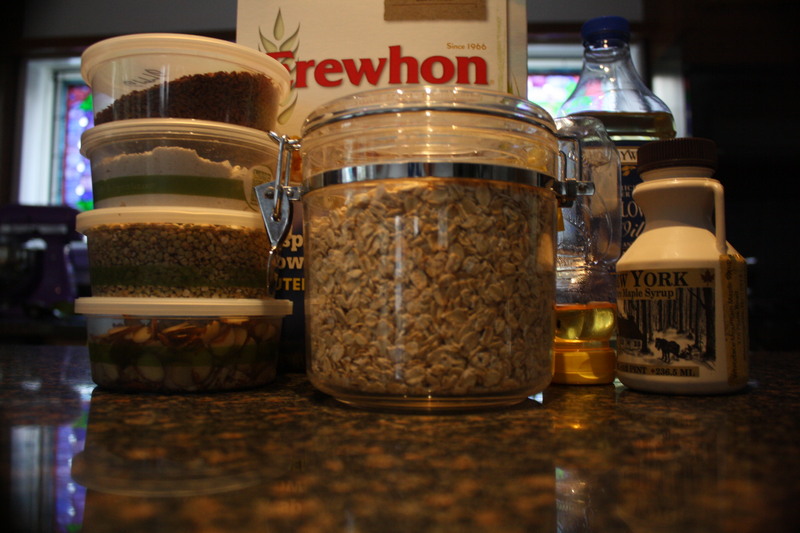 I used 1/4 c of flaxseed and whole buckwheat groats (not ground). I think I added roughly 1/2 c of nuts. I imagine coconut oil would be delicious—let me know if you decide to try it!